Recently, I saw a post of Living Montessori Now about DIY Montessori Teen and Ten Boards. To be totally honest, I knew nothing about the boards until I saw the post. But once I did, I instantly knew I needed to make my own set. See Henry has been super interested lately in counting past 10. Usually, it goes something like 10, 11, 12, 18, 14, 15, TWENTY!! 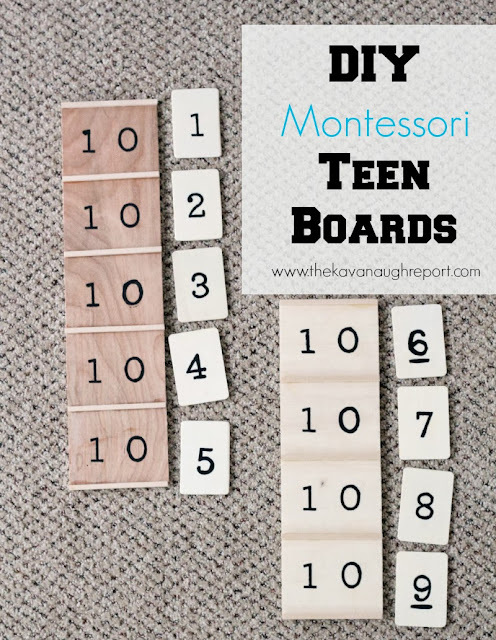 To foster this interest, and help Henry get a better grasp of how the numbers relate to each other and to 10, I wanted a teen board available to him in our classroom. 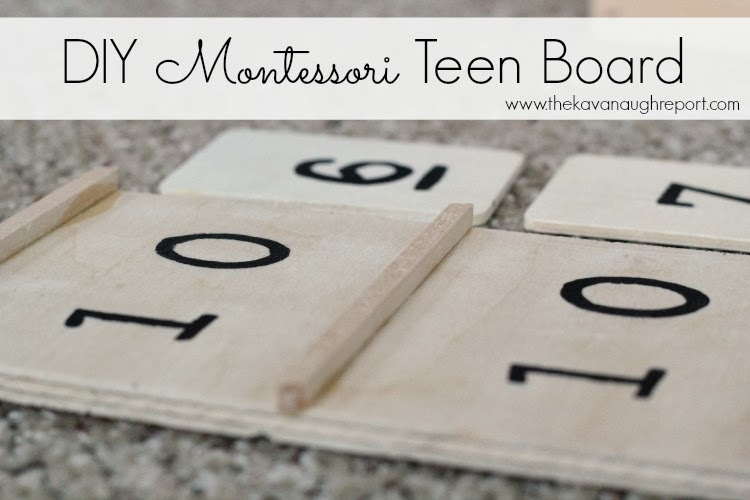 In the Living Montessori Now post, I found this tutorial. I used it as a basis for my boards. But I changed a few things just because neither Morgan or I are handy with power tools so we had to find things we could actually do. (2) Craft wood - 3/16" x 24" square sticks. I got this at Michaels. (9) 2" x 3" wooded tablets. I got these at Michaels. Using the 4" plywood board as a ruler, cut the craft wood in 4" strips with the X-acto knife. I found that scoreing each side with the knife made them super easy to snap. Since I didn't trust that the board was totally even, I did this by cutting one strip at a time then using the super glue to glue it in place. Then, I would place one wooden tablet down, and measure my next strip of craft wood, and glue it into place. This worked perfectly since the tablets were slightly different sizes from one another. This way, all of the tablets had exactly enough room in their slot and the craft wood was cut to the exact size I needed it. Repeat that process five times on one board, and four times on the other. Once I knew exactly how long the boards needed to be, we used a jigsaw to cut the board exactly to length before I glued down the final piece. Once the craft wood dividers were glued on, I made sure to sand all the edges so that nothing was sharp. Then, I used the stencils to paint the numbers on -- the number 10 on each of the slots in the boards and 1-9 on the wooden tablets. And, they were ready to use. The whole project cost me around $10, if you don't count the stencils -- which brought the project to around $15. Amazing! I love the idea! Wow! These look great! I tend to shy away from almost all things that have anything to do with wood and DIY because, well, I have NO idea what I am doing :) This looks wonderful!